In our recent Books for Kids donation campaign, our generous members donated enough credits and PBS Money to provide 12,511 books to needy children in Georgia. Richard Pickering, President and Founder invited long-time PaperBackSwap member, Jerri Adkins, to join him in distributing books to the students at Midway Elementary. Jerrie, herself, donated all 1200 credits for this school! Below are their memories of that special day. We all work very hard at PaperBackSwap to bring you the best in swapping books all over the USA. And our club members are the best! Recently, due to your generosity, I had the opportunity to hand out new books to kids at Midway Elementary School (preK – 5th grade). These kids do not get much in the way of gifts and have a very tough life. I was honored to be able to hand out these books due to the generosity of so many of you who donated credits in order to make this happen. The smiles on their faces were priceless. When I explained that they could take 2 new books home with them, they could not believe it. Many of them brought thank you cards. And here are a few pictures from the actually event where we met the kids. I can not tell you how proud I am of each and every one of you who made a donation (either with credits, money for shipping, or both). We have a wonderful community of members who truly care – about each other and through the gift of giving. Thank you so much for all that you do in making PBS a blessed place to share our love of reading! Y’all know about the School Donation Program, yeah? It’s one of our very favorite holiday things to do. It’s such a kick, to donate to a dozen schools in ten states. Last year, I’d been saving up credits all year, looking forward to it. But it’s popular, and folks are generous, so it fills up fast. I wound up with lots of extra credits left over, and jumped up and down a bit. Richard contacted me about something more local with a school he had worked with before. Now, ego-boost aside, the whole point is to get books to the kids. (When a book in my house becomes both a book in someone else’s house and a book in a kid’s hands, that’s math I can get behind!) He did the legwork, and I did the driving (all two hours of it, with a stop to change, so the kids would feel important enough to get dressed-up for). Fortunately, the media specialists had already sorted out the books for Midway onto age-appropriate tables. We had to keep shooing the smaller kids away from the big-kid table, as one does. They brought them in, wave on wave, class after class. Surf’s up! I was very grateful Richard & the others were there to help. It was all an excited, rainbow-butterfly blur for several hours. Several of the classes made adorable thank-you cards. Richard kept directing them to me (possibly because I’d brought a bag?). The children were very excited about the books, talking about reading them, selecting some for siblings, possibly swapping them out in their classrooms, etc. It was lots of fun, but draining. I was very glad to have done it. Best of all, there’s now a summer program, so everyone can get in on the fun. I knew that the 2014 PaperBackSwap Cruise would be a great time to meet club members, participate in book-themed events, and share in our love of reading. It was going to be fun (and it was)! But I never expected that our itinerary held an event that would affect me deeply. As the cruise ship pulled into Belize, I was informed that there was a surprise event scheduled, in which I would be needed to participate. “Dress appropriately, as a representative of PaperBackSwap,” Cheryl G. (Poncer) said. That was all I was told. About a dozen of us —PBS members and some staff — got off the boat and made our way to the taxi stand, where we boarded a van that whisked us away. As the roads became bumpier and turned from asphalt to hard-pack dirt and stone, my curiosity mounted. “Where are we going?” I asked. The rest of the group smiled knowingly, and Cheryl G assured me that this would be an adventure that I would never forget for the rest of my life. The van turned down one last dirt road. There was a gate at the end, and beyond that, the building that was apparently our destination. Finally, I was let in on the secret: this was a small orphanage, home to 42 children whose parents had died of AIDS. The staff greeted us with open arms and thanked us for coming. Many of the older children were in school, but the younger ones were there, and anxious to meet us. We went into the day care center, which was very clean and nicely appointed. The high ceilings and fans kept the room cool, and the walls were covered with drawings that the children had made and gold stars for good behavior or outstanding scholarship. Another surprise! The group (led by Gail P.(TinkerPirate and Cheryl G. Poncer) had brought along over 100 books for the kids, carrying them in their luggage onto the cruise. That was enough so that each child would get a couple of books, with plenty more to share with each other. I read a story aloud to the kids, about a farmer with a problem – cows that could type! The cows had a lot of demands for the farmer. It was a fun story, and the kids were very attentive. After the story, our team distributed the books and also gifts that the group had brought, and then we spent some time playing games with the kids. After goodbyes and hugs, it was time to leave. Cheryl had been right — I would never forget the day, the kids, the orphanage staff who took such loving care of them, the appreciation for the books and our visit. It was so moving to consider the life that the kids had led, the circumstances that brought them to this place, and the life ahead of them. I was proud of our group for coming up with the idea to visit the orphanage. On top of planning all the fun events of the PaperBackSwap Cruise, they had gone deeper and found a way to give back. How typical of PaperBackSwap members! It’s been 10 years since the club’s launch, and the generosity and kindness of our membership continues to amaze me. 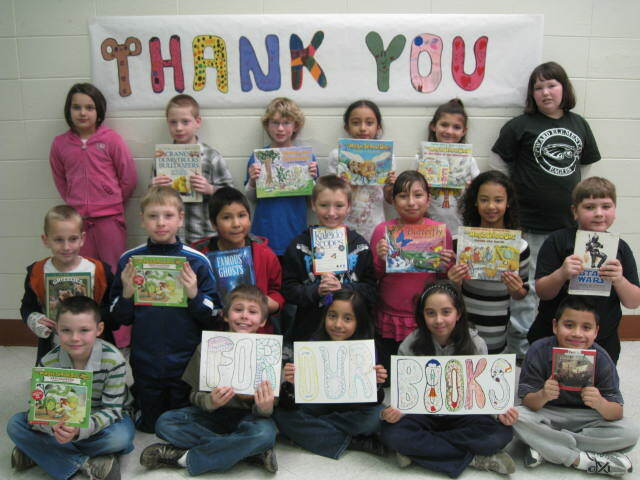 It’s the kind of giving that makes our Books for Schools campaign such a success every year. So many members have asked us when the next Books for Schools will go live. We’re happy to say that BFS 2014 will be launching very soon! We are planning to begin right after Thanksgiving. You can read about Books for Schools, see a list and details of previous participating schools, suggest schools for future inclusion, and if you want to get a head start on donating before the BFS 2014 launch, you can use the Give Credits button on this page. Our thoughts and prayers remain with those children in Belize. May God bless each and every one of them, and guide them in their lives going forward. And may God bless each and every one of our club members. We love your giving spirit! Thanks to all those who made the Orphanage visit happen: Gail P (tinkerpirate), Cheryl G (Poncer), Ajay I., Barbara S (barbelaine1), Cari (ladycari), Kareena I., Len S (lens), Marie N (pottergal), Rick (RickMatt) , Sonal S (ComeGo), our driver Stanley, the staff at the orphanage including Director Agatha Valentine, and of course the kids!! !